Westfield Health Sheffield Hatters got their defence of the WBBL Trophy off to the best possible start with a crucial 82-72 road win over the league-leading Nottingham Wildcats. Georgia Gayle (22), Steph Gandy (22) and Helen Naylor (18) combined for three quarter of Sheffield’s points, with Gayle posting the most impressive numbers by adding eight rebounds and six assists. Hatters are in pursuit of a third consecutive Trophy crown, and had won both of the previous meetings between these formidable rivals in this competition, including the 2015 final. And they got off to a fast start in this game, leading from the early stages and throughout as Gayle scored nine first quarter points, including two free-throws to make it 17-8 after six straight points. She added another five in an 11-3 surge to open the second stanza, and Hatters led 31-15. Wildcats - coming into the game on the back of a defeat in last week’s WBBL Cup Final - could get no closer until the fourth quarter, when Joana Ferreira and Siobhan Prior hit three-pointers to narrow the gap to 63-57. But Naylor kept them at arm’s length, immediately responding with a triple of her own; and when she added another shortly after, the lead was back out to 71-61 inside the last four minutes and there was no way back for the hosts. It was a third straight win for the Hatters, but only a second in the last six meetings against Nottingham. 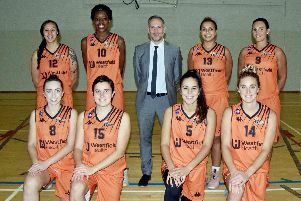 Gandy and Gayle were named in the WBBL All-Star Five team.